While I don’t mind paying for services or gadgets that I think my family needs, I am against spending money on unnecessary things. For example, I refuse to pay airline fees due to my luggage being over 50lbs. To me, this is an obvious money grab by the airlines and I refuse to pay. At one point, I actually took some stuff out of the luggage and put it in a carryon bag just to avoid the $25 fee. For people like me who try to avoid these fees, EatSmart came out with a new scale designed to safely and accurately weight our luggage. To say the least, I was very excited when I found out about this product and couldn’t wait to review it! Are you worried about having to pay fees the next time you go on a flight for your luggage? With the EatSmart Precision Voyager Luggage Scale you will never have to worry about paying overweight luggage fees again! This two handle grip scale is compact, lightweight, and allows you weight your luggage just by picking it up with the scale. This durable strap and easy clip buckle scale can weigh up to 110 pounds or 50 kilograms. 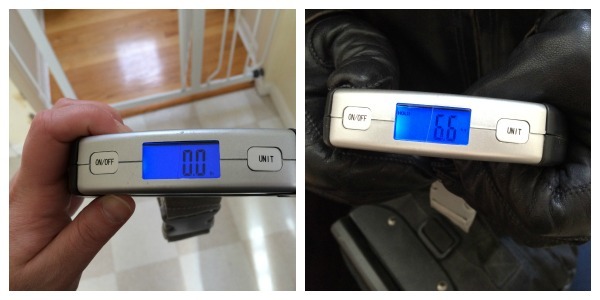 With this scale, you will never have to pay unexpected luggage fees again! I will freely admit, this is one of the neatest travel gadgets I have seen in a long time. Not only is it easy to use, but it gives you helpful information that can save you time and money! Never again will you be opening your luggage at the airport to avoid luggage fees. To keep the unit working as long as possible it also has a 20 second auto shut off. Really, I am wondering why I didn’t have one of these scales sooner, especially when my husband was traveling for work just about every week with IBM. Based on my own opinion, I am happy to give the EatSmart Precision Voyager Luggage Scale an A rating and highly recommend it to my readers. Want to purchase this high quality scale for yourself? 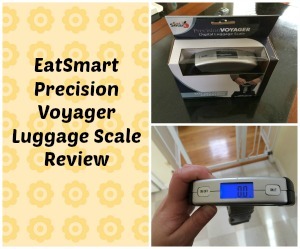 You can purchase the EatSmart Precision Voyager Luggage Scale for $19.95 on Amazon.com or at the EatSmart website! 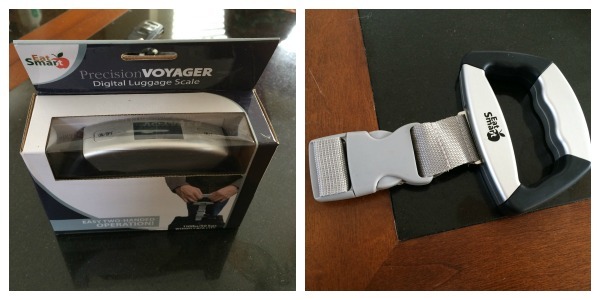 I just had to stop by and post that I actually have the eatsmart precision voyager luggage scale and it works great. This comes in so handy when traveling.especially back home. With the rising cost of luggage fees this would make a great gift for anyone who travels a lot. This would be great to win. What we normally do is get on the scale with the luggage in hand and try to weigh the luggage that way. This would be so much easier and probably more accurrate. I do not like to pay the extra luggage fee either. I’m actually wanted to have the eatsmart precision voyager luggage scale and I’ve heard that it works great& so handy when traveling. With the increase of luggage fees this would make a great devise for anyone who travels extensively. Not only can this be used for luggage I am sure that there is a million other uses. I would love to have this to try we are going on a vacation in a few months and would love to try it out. We are constantly over-packing. Thanks for the info! I think this is one of the greatest items for those who travel. How horrible it is to have to open up luggage and remove items just to avoid paying a fee that is totally unnecessary in the first place. I would love to win this so I can avoid having to go through this embarrassing situation ever again. Thanks for the chance to win it. This looks like a handy gadget. I’d be great for my packing when I’m traveling! I bought a luggage scale for my hubby a few years back and it’s proven itself to be a valuable investment time and time again! We travel quite a bit and this scale would really come in handy. Thanks! We have of these and love it! Easy to use, precise, compact and lightweight – perfect for the traveler. I always worry about over packing and having to pay the huge fee because of it. This would add less worry for when packing and seems to be much more reliable then the cheep ones you come across. This scale would be great for when I travel because I refuse to pay those extra fees! It happened to me once and it was just a few pounds over! We definitely could use this to prevent us from over packing and scrambling at airport to move weight between bags. My hubs and I have several upcoming trips. It would be helpful to have a luggage scale. I usually use the bathroom scale but it is hard to see the display and I always worry that my bag could be over weight. This looks like what we need. We are traveling to Puerto Rico soon with a family of five and packing is always so hard. We fly to see family quite often and I always have to try to use our scale to guess what the suitcases weigh. It seems like now a days people need to have a luggage scale. This is perfect for anyone who is going on a trip. I have never bought one of these before but am considering this as an option, thx for the review! this is really cool! especially considering most people overeat when on vacation! what an awesome gadget, i’ve never heard of it. thanks for sharing!